This is a CTTE chartlet based upon a survey completed during October, 2016. 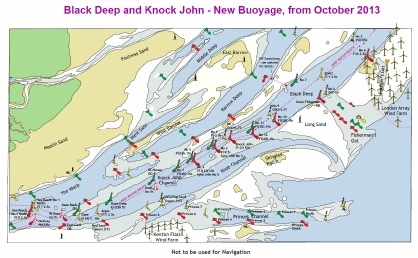 Changes to depth across the Quarters has required a change to the buoyage which was re-laid in April, 2017. Deep draught yachts (i.e. 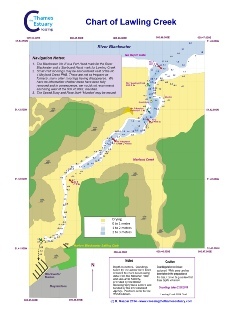 @2m draught) is recommended to follow the suggested route at LWS. 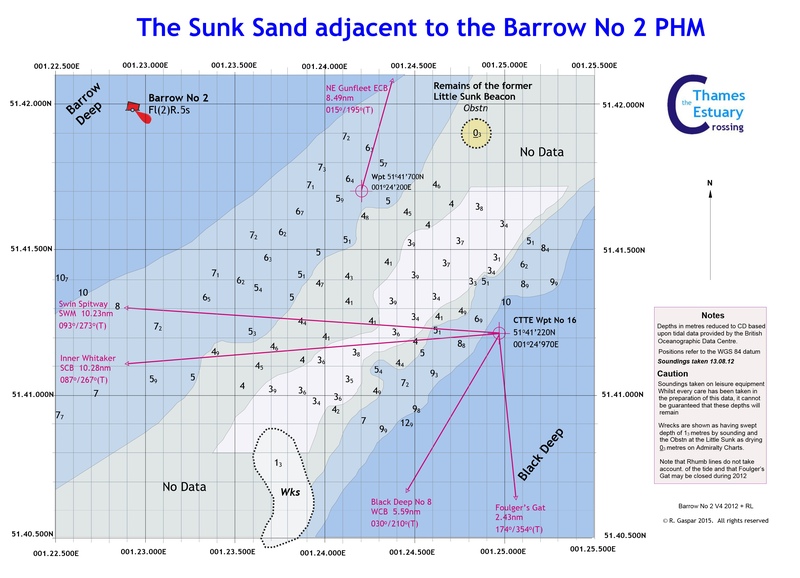 Note this has been amended this month (May) to show the 'Obstn' SW of the Nass Beacon is not now annotated as ED. It DOES exist and should be regarded as dangerous to leisure craft. This is a CTTE chartlet based upon a survey completed on Monday, 13th August, 2012. This is the obvious crossing point of the Sunk Sand for those intending to use Foulger’s Gat. The crossing area is bounded by two wrecks to the south-west and the wreckage of the old Little Sunk Beacon to the north-east. 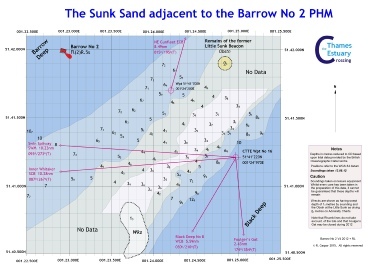 All hazards are unmarked but there is ample room assuming a valid GPS signal over sand which appears to be flat and uniform with at least 3.0 metres at CD in the surveyed area. 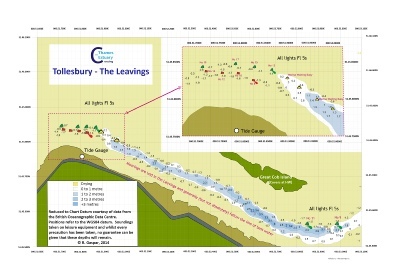 The SW Sunk was re-surveyed on 7th June 2016 at LW Springs. 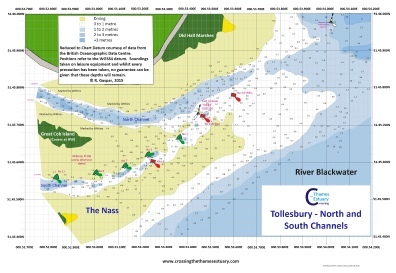 The swatchway has migrated a little to the north-east and consequently any previous chartlet is no longer accurate and should NOT be used. 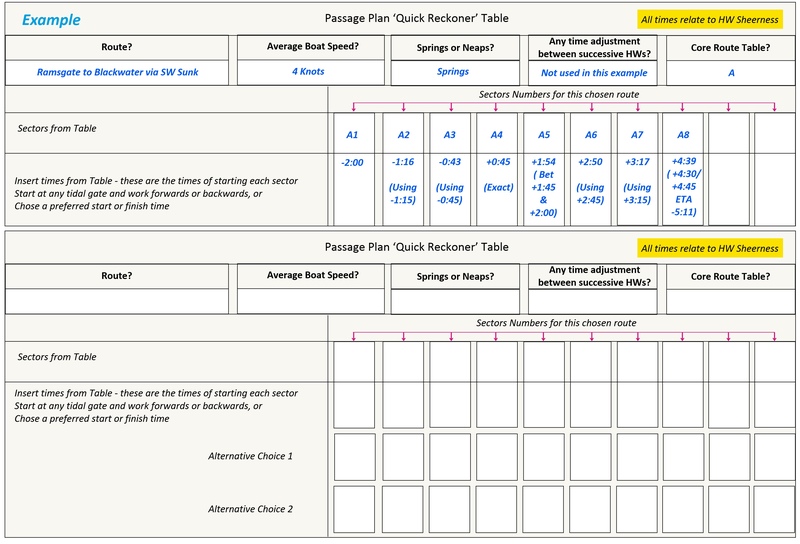 Chartlet 'SW Sunk Swatchway 2016, V1' is the current chartlet. 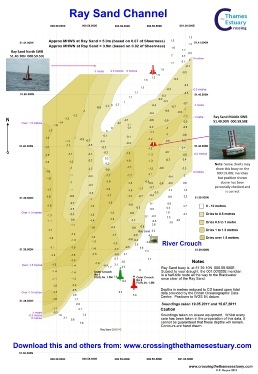 The preparation of the chartlet was kindly provided by live tide gauge data by the Port of London Authority which assisted in reduction to Chart Datum. I am grateful for their prompt and helpful assistance. 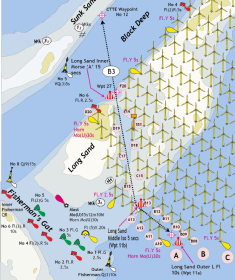 Note: In 2016, there were new waypoints and recommended rhumb line. Please delete any previous waypoints. 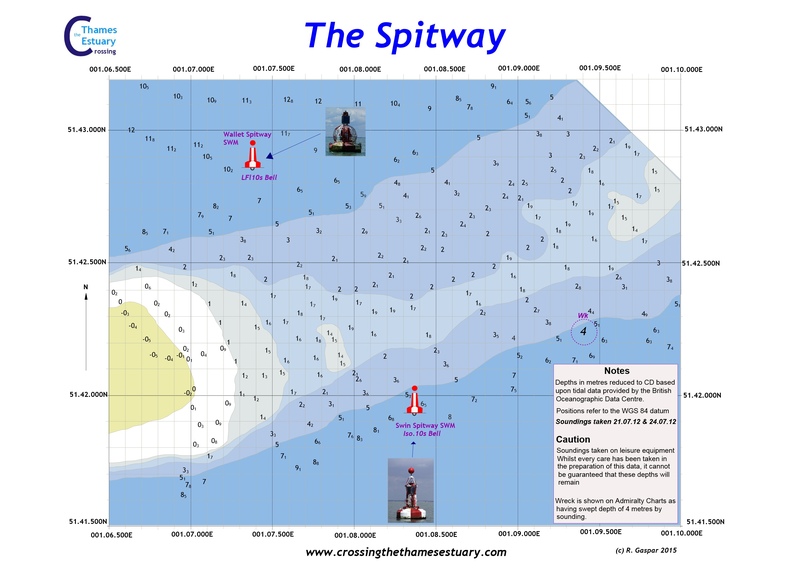 I included a middle waypoint and two short tracks to follow the curve of the swatchway. It is important not to allow your course to go south of the rhumb line as the knoll to the south is steep-to. To go north of the rhumb line is forgiving. This is a CTTE chartlet based upon resurveys on 21st and 24th July, 2012. Subsequent spot checks in 2013 and 2014 suggest no significant change. Whilst the Buxey Sand is relatively steep too to the west, at the right state of the tide and with a craft of the right draught, it is possible to pass well to the east of the two Spitway buoys. This is a CTTE Chartlet based upon surveys in 2011 and October, 2012. 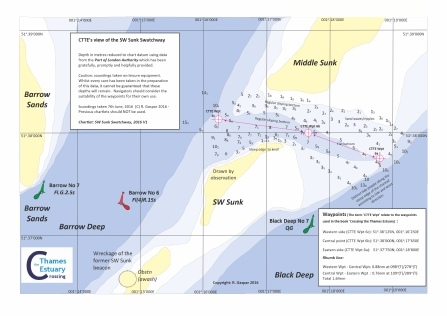 A spot check in 2014 suggested no significant change in depths. 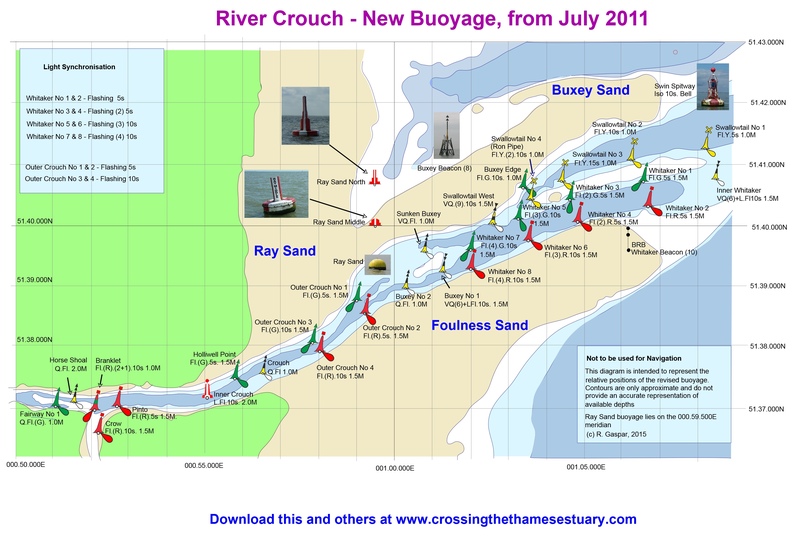 The revision of the Crouch buoyage in July, 2011 provided some surplus old buoys which the Crouch Harbourmaster has kindly used to add to the Ray Sand Buoyage. 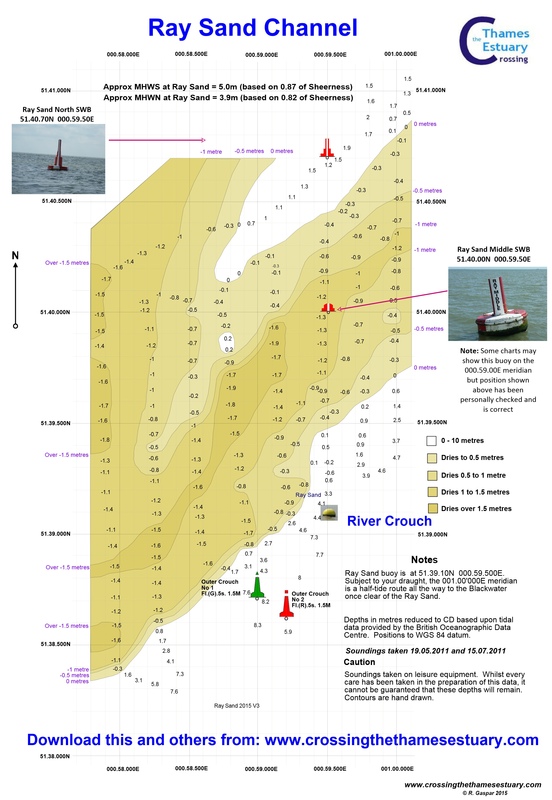 The three buoys, the Ray Sand buoy, the Ray Middle and North are lined up on the 000.59’500E Meridian which is pretty much the best ‘water’ (2012). Note that some charts incorrectly show the Ray Sand Middle on the 000.59'000E meridian and not as above. The comprehensive buoyage changes were completed in July, 2011. You may either download the Crouch Harbour Authority Chart or the CTTE version which is perhaps more suitable for A4 printing. 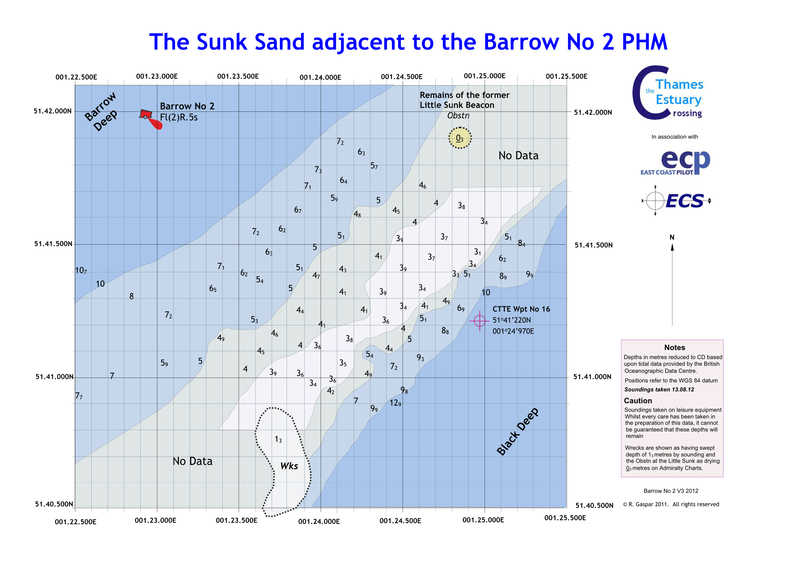 Note that the CTTE version now includes the full Ray Sand Buoyage. 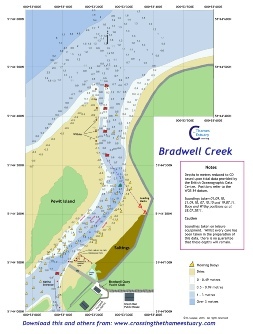 Data on depths in Bradwell Creek. 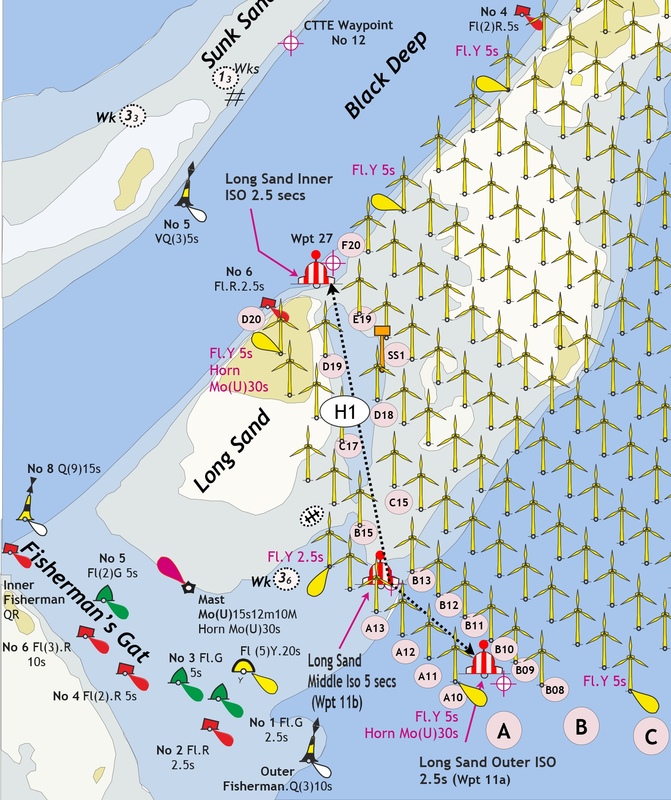 This chart is from soundings taken in September and October, 2010 and a re-surveyed 19.07.2011. On 22.07.2011 six new withies were put into place on the eastern edge of Pewit Island and the red cans adjusted and these are now included in this latest version. NOTE: I have not had the opportunity to resurvey Bradwell in 2015 but in visits it seems to me that the creek has largely remained as in 2011 with the exception that the shallow ‘bar’ now extends from half way between the first and second red cans as far as the third red can. This ‘shallowing’ does, however, appear to be soft mud - TG was able to power through it. This is a CTTE Chartlet based upon surveys in 2011 and 2012. 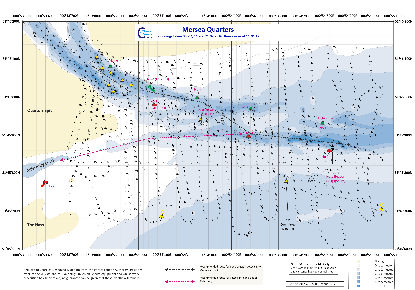 This includes the repositioning of buoys during May, 2012 and 2014. This is a CTTE Chartlet based upon surveys in 2011 and 2012 with corrections to 2015. This is a CTTE chartlet based upon surveys in 2011 and 2014. 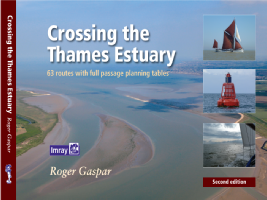 It includes the additional buoyage put in by Maldon District Council for 2012. 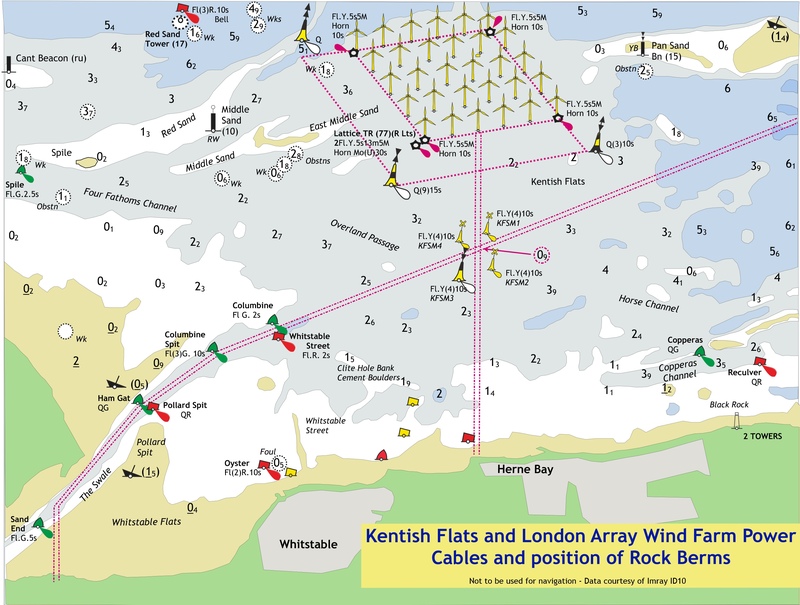 This is CTTE’s impression of the route through the London Array Windfarm as from 2014. 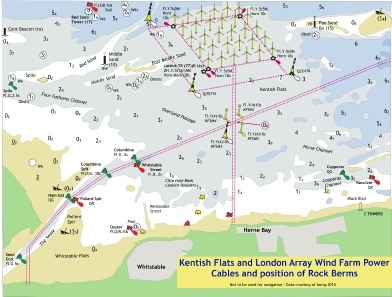 This is a CTTE drawing based upon Imray data showing the Rock Berm area where the main cables from the Kentish Flats and London Array Wind Farms cross over. Original image is copyright of Imray. Amendment 1: to include change of one of the special marks to a cardinal buoy and for the removal of the Spaniard cardinal buoy. Revised to include one minor PLA correction, UKHO Notice to Mariners 4255(P) 23rd September, 2013 and PLA Notice L16 of 2014. 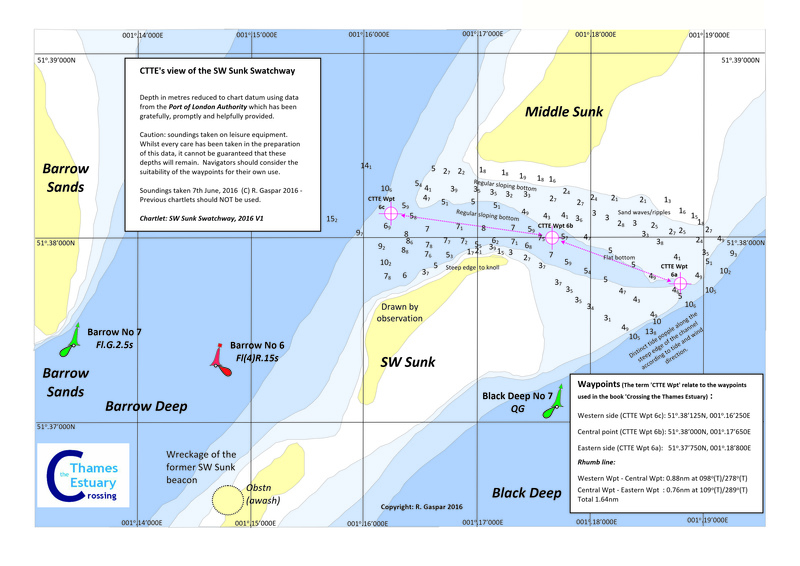 This is a CTTE publication showing the detail of the buoyage changes to Sea Reach (during August, 2013 and 2014) and the Oaze Deep to the Sunk Centre via the Knock John and Black Deep (during October, 2013). 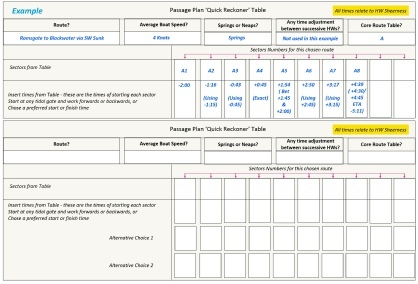 The publication includes a table of the changes and three images showing their relative positions. Please download copies as often as you require. Please note that the Notices to Mariners service is regular and is added very week. No notification is therefore provided.